1866-2016: 150TH ANNIVERSARY OF THE MARTYRDOM OF PROTESTANTS BY PAPISTS AT BARLETTA, Italy. 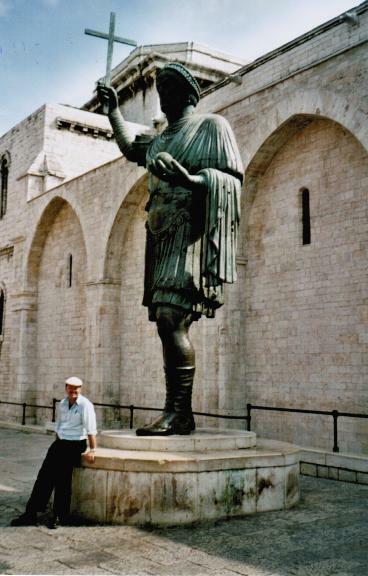 Gavin on his first trip to Barletta in Aug. 2001 at the statue of a Roman Emperor, outside the Roman Catholic Basilica of Santo Sepolcro, from which the Romanists came with their Popish priest on 19 March 1866 to martyr five Protestants. 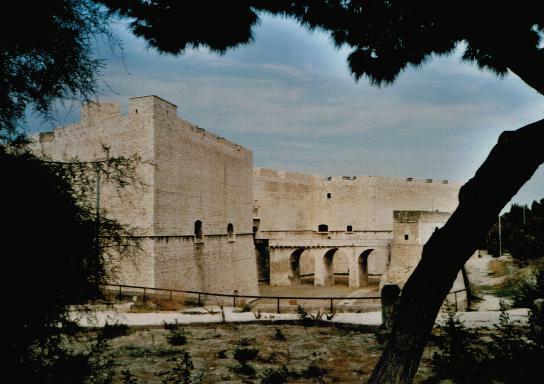 Barletta Castle, Aug. 2001. 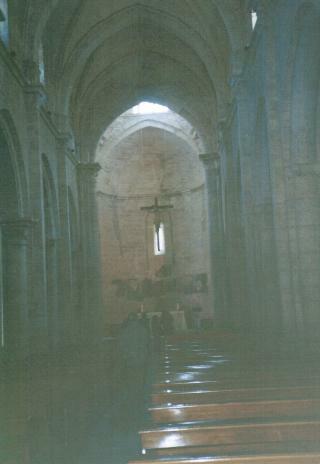 It was used by Romanist Crusaders. In the 13th century the 6th Papal Crusade was launched from this port city, reminding us of when the Pope’s Last Crusade (Dan. 11:40-45) is launched during the “the mark of the beast” era (Rev. 13:15-18) with a world-wide Romish Inquisition to make the world Romanist. 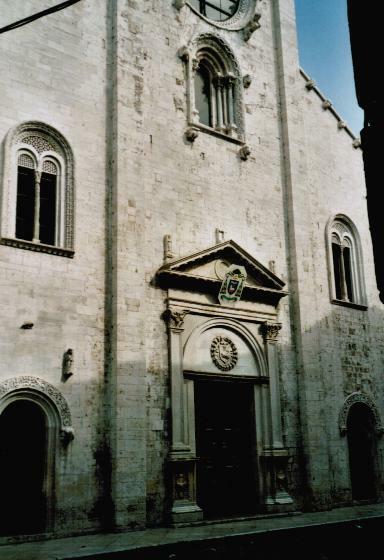 Great Saint Mary’s (Italian, “Santa Maria Maggiore”) Church of Rome Cathedral, Barletta, is on the former site of the Italian pagan temple of Neptune, the pagan Roman god of the sea, a fact which reflects Barletta’s sea port history. Neptune was identified by the pagan Romans with Poseidon, a pagan god of earthquakes and the sea, whose earthquake powers are in turn attributed in local tradition by the Roman Catholics of Barletta to the Crucifix of Barletta at the Basilica of Santo Sepolcro, below. The Papists came out of Santo Sepolcro, in their rampage to martyr Protestants as they screamed, “Death to the Protestants!’” (London Times, 9 April 1866). Aug. 2001. Inside this Cathedral, a Papal Crest of Pope Pius IX (Pope 1846-1878) who in 1847 allegedly made Joseph “patron of the universal church.” This would be most likely why the Barletta Papists regarded St. Joseph’s Day on 19 March as so important, and the Protestants telling the Papists one does not “have to keep” St. Joseph’s Day was a key issue in the lead up to the martyrdoms of Protestants on 19 March 1866. In 1854 Pius IX also promulgated the Romish teaching of “the immaculate conception” of Mary in Anne’s womb, which was retrospectively declared “infallible” in connection with the First Vatican Council of 1870. Aug. 2001. 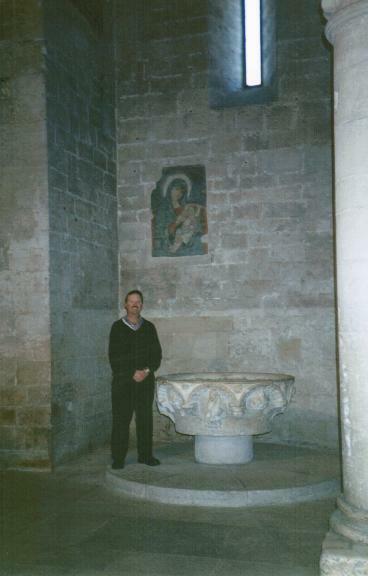 Gavin’s second visit to Barletta, earlier in March 2002. 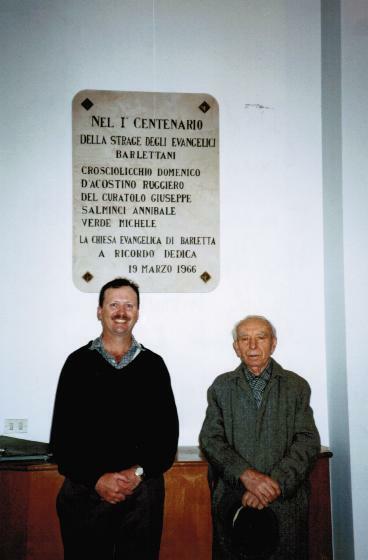 Gavin with local Protestant church historian, Emmanuele Dumbra, under 1866-1966 100 year anniversary plaque to the five Protestant martyrs at the Evangelical Baptist Church (Italian, “Chiesa Evangelica Battista”) at Barletta, Italy. In front of these houses in Nazareth Street, a fire was lit, onto which the Romanists threw the Protestant Christian martyrs in March 1866. 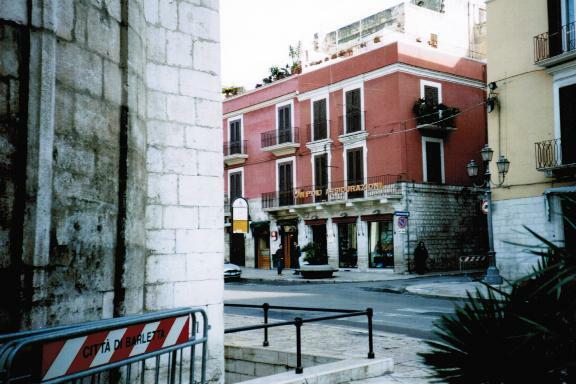 Gavin’s second visit to Barletta, earlier in March 2002. 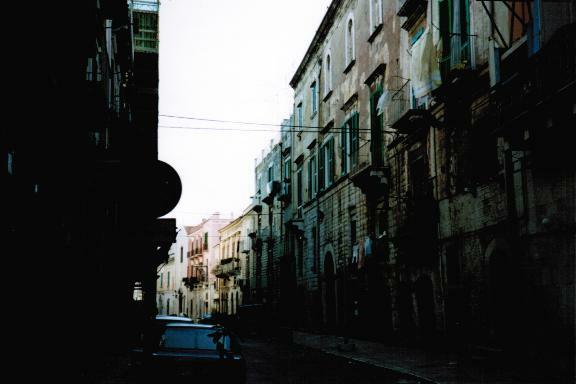 Gavin’s third visit to Barletta, later in March 2002 (on return from visit to Greece via return ferry from Bari, Italy). Inside Romanist Basilica of Santo Sepolcro, Gavin stands under an old Marian picture used by Mariolatrous Romanists present in 1866. 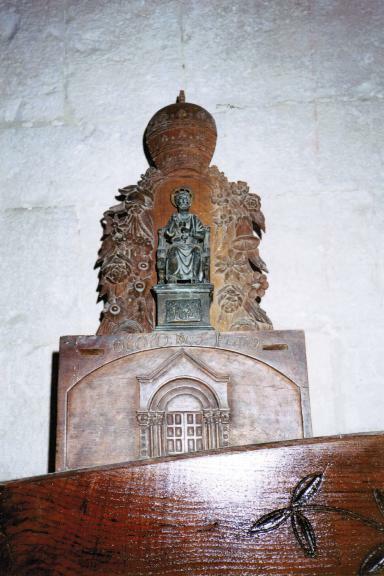 A tabernacle of this Church (usually kept in the Vestry, it only goes out into a chapel on certain occasions,) into which is put the reserved sacramental bread that Romanists idolatrously adore. 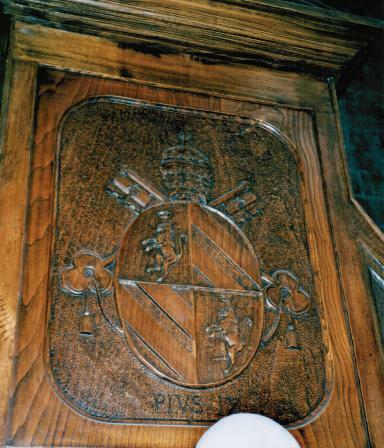 It dates from the 1800s, and shows St. Peter sitting under a Papal triple tiara, and like all Papal Mitres, all Papal Tiaras figuratively contain the figures “VICARIUS FILII DEI” (“Vicar of the Son of God”) which in Roman numerals tallies “666,” because they are purported grants of the fraudulent “Donation of Constantine” which dates from the mid 8th century, and which uses this semi-formal Papal title. Latter March 2002. The Crucifix of Barletta in latter March 2002. According to local Roman Catholic tradition, this crucifix came to life (cf. Rev. 13:15) when during an earthquake at Barletta in the 15th century, it opened its eyes and performed a miracle, saving the city. Thus this Crucifix of Barletta at the Basilica of Santo Sepolcro is attributed with the earthquake powers of the pagan god Poseidon or Neptune, on whose site the Romanist Cathedral of Barletta is built, above. 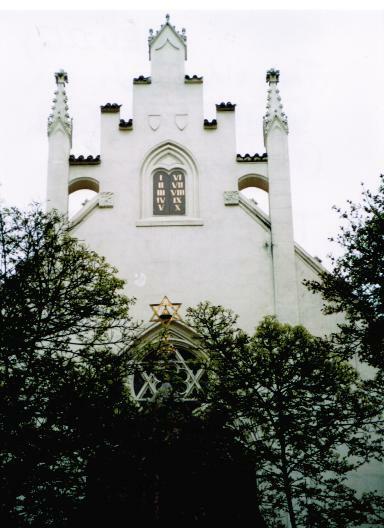 The martyrdoms of 1866 at the end of the 1260 day-year prophecy (Num. 14:34; Ezek. 4:4-6) of 607 (formation of the Office of Roman Papacy & Office of Antichrist) to 1866 (loss of the Papal States 1860-1870) (Dan. 7:25; Rev. 12:6; 13:5), are prophetic types of the still future persecution of Protestant Christians by the Papal Antichrist and Church of Rome in the future “mark of the beast” era. 1416-2016: 600TH ANNIVERSARY OF THE MARTYRDOM OF PROTO-PROTESTANT, JEROME OF PRAGUE, BY PAPISTS AT CONSTANCE, Germany. 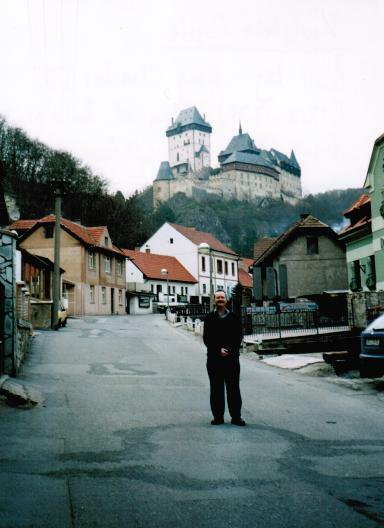 Gavin in front of Karlstein Castle in Bohemia, Czech, April 2004. 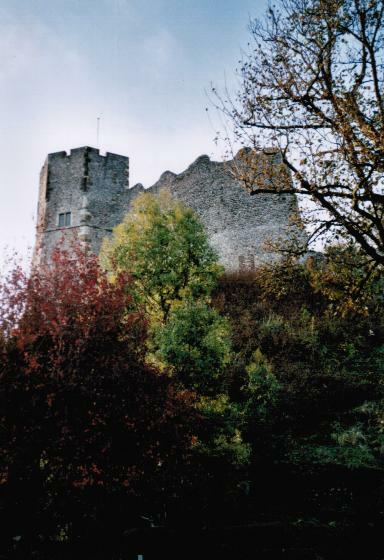 Built by the King of Bohemia, Charles IV in 1346, this castle would have been known to both Huss of Bohemia and Jerome of Prague. 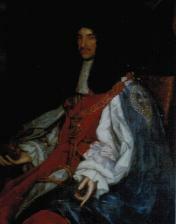 This same king also built Charles University in Prague, where both Huss and Jerome taught. 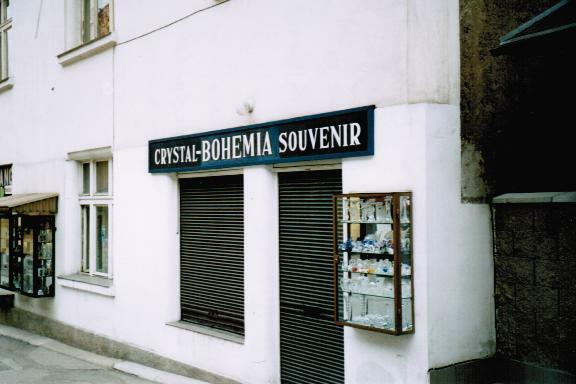 As seen by this shop at Karlstein in modern day Czech showing crystal glassware displays in two cabinets under the name, “Crystal-Bohemia,” this region is still known as “Bohemia” especially with reference to glassware. April 2004. The Maisel Synagogue in the historic Jewish Quarter of Prague, Bohemia, Czech, April 2004, was built in the 16th century. Its usage of two tablets numbered in Roman numerals “I” to “X” for The Ten Commandments of Exodus 20, reminds us that “the Bishop of Rome” “would not let” the “people” “have as much of God’s Word as the Ten Commandments wholly and perfectly, withdrawing from them the Second Commandment” against idolatry (Exod. 20:4-6) (and using a breakup that splits the Tenth Commandment in two to get the number of “ten” back) (Anglican 39 Articles, Article 35, Book 2, Homily 21). 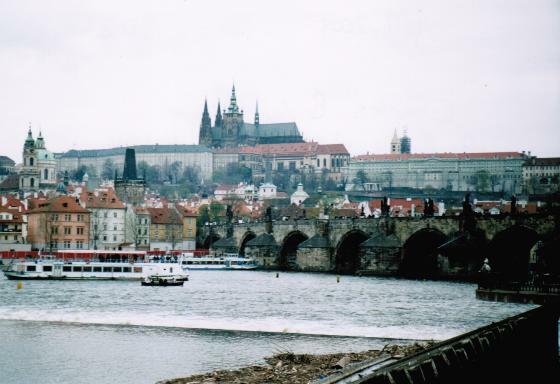 Charles Bridge, Prague, Czech. Looking up towards the area of Prague Castle, and Prague Roman Catholic Cathedral (in the top centre of photo), which both in the time of Huss of Bohemia and Jerome of Prague calling for reform, and also through to the present time, is a site of much idolatry contrary to the Second Commandment of the Holy Decalogue (Exod. 20:4-6) e.g., Mariolatry, and adoration of the consecrated Communion bread. April 2004. 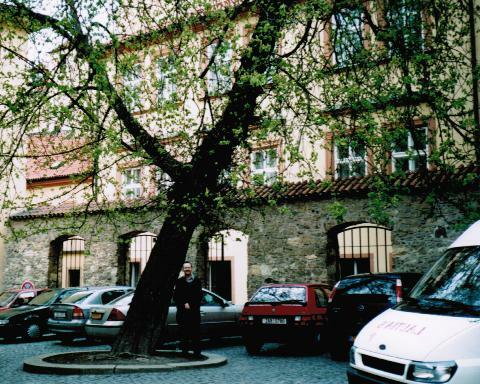 Gavin at an old section of Charles University (to the left is the university archives; and other side of building connects to the Town Square), where both Huss of Bohemia (martyred 1415) and Jerome of Prague (martyred 1416) were teachers. Prague, Czech, April 2004. Gavin standing at the pulpit door entrance to the pulpit that Huss of Bohemia preached at. 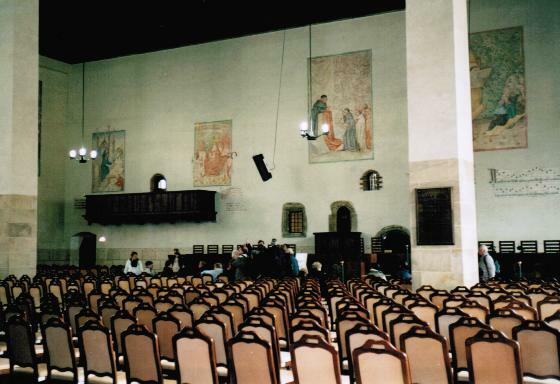 Bethlehem Chapel in Prague, Czech, April 2004. The teachings of Wycliffe, Huss, and Jerome of Prague were picked up and manifested in their fullness with the Protestant Reformation. 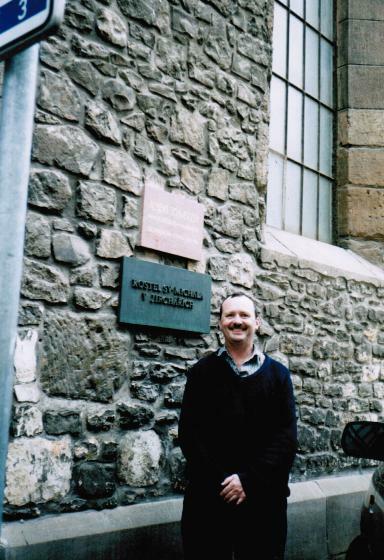 Symbolizing this Protestant triumph, Gavin at St. Michael’s Lutheran Church, Prague, Czech, April 2004. 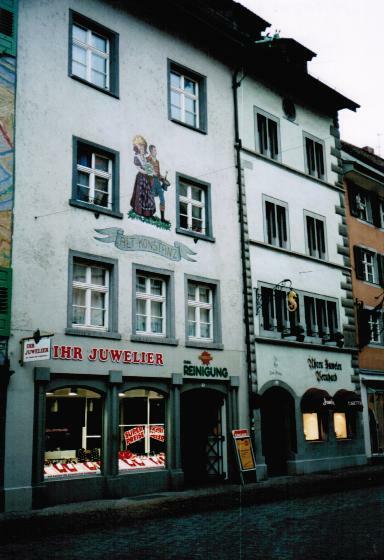 Jerome of Prague’s House, Constance, Germany (right grey building). 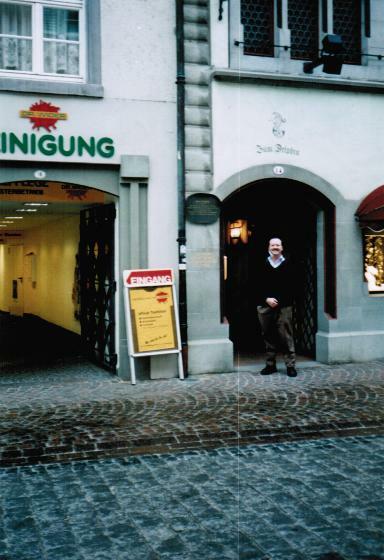 This is where the proto-Protestant, Jerome of Prague lived when he came to Constance in the unsuccessful hope of helping Huss of Bohemia. April 2004. 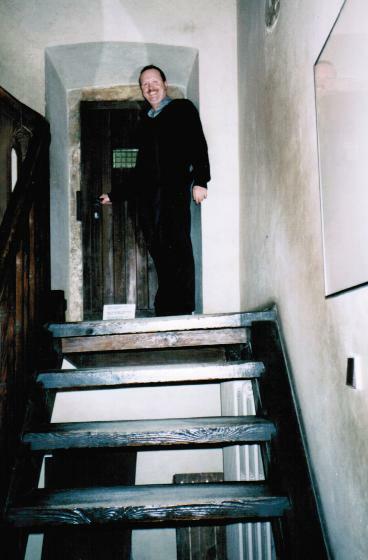 Gavin at the doorway of Jerome of Prague’s House, Constance, Germany. A plaque on the house written in German calls him, “Hieronymus von Prag,” and connects him with “Jan Hus” (John Huss). April 2004. 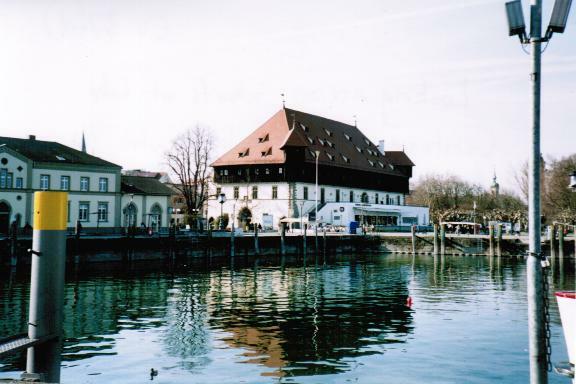 Looking across wharf at Lake Constance to the (red roofed) building where the Romanist Council of Constance (1414-1418) sat, and wickedly condemned the proto- Protestants: Wycliffe of England, Huss of Bohemia, and Jerome of Prague. April 2004. 2 Hussentein Street, Constance Germany, April 2004. 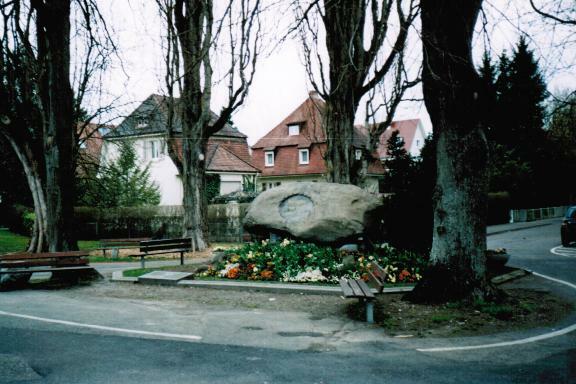 Block of stone marking the spot where Jerome of Prague was martyred on 30 May 1416. 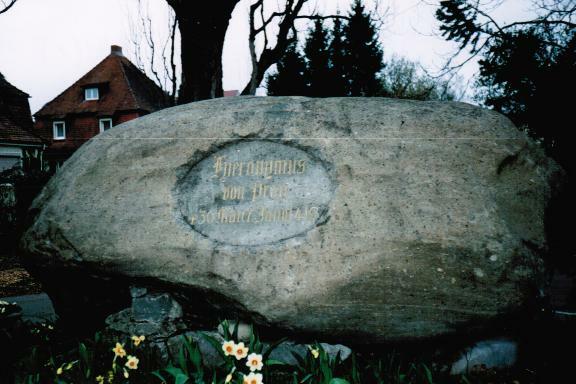 The spot where the proto-Protestant Jerome of Prague was martyred by Romanists in connection with the Papist Council of Constance (1414-1418) (on the stone is etched in German, “Hieronymus von Prag” “1416”). The opposite side of stone reads, “Johannes Hus” (John Huss) “1415,” as both were martyred at the same spot, with Jerome of Prague being an assistant of Huss of Bohemia. 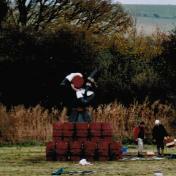 April 2004. The proto-Protestant teachings of Wycliffe, Huss, and Jerome of Prague were picked up and manifested in their fullness with the Protestant Reformation. 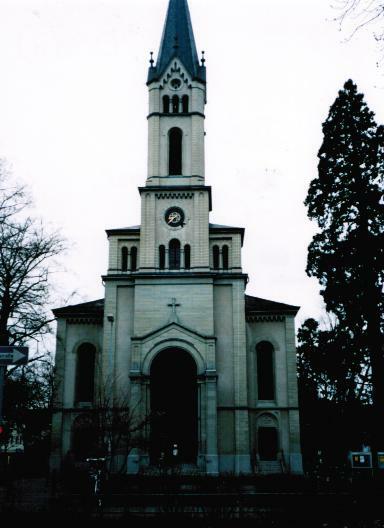 Symbolizing the Protestant triumph, Lutheran Protestant Church in Luther’s Square (German, “Lutherplatz”), Constance, whose foundation stone was laid in 1865 to mark the martyrdom of Huss 450 years before in 1415. April 2004. 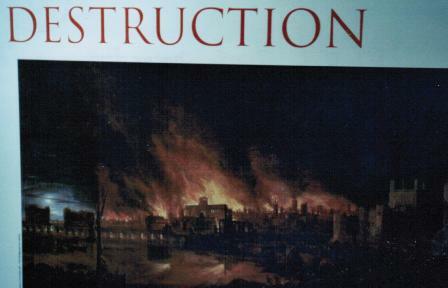 1666-2016: 350TH ANNIVERSARY OF THE GREAT FIRE OF LONDON. 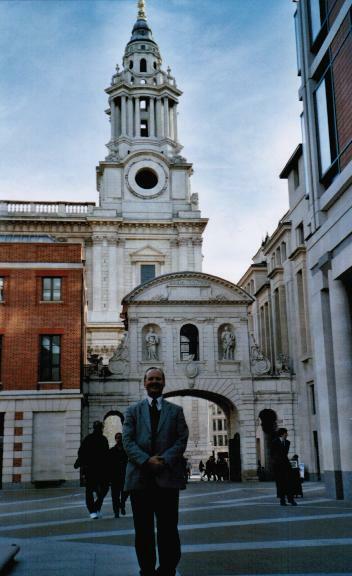 Gavin at St. Paul’s Cathedral, London, on 10 Oct. 2008. 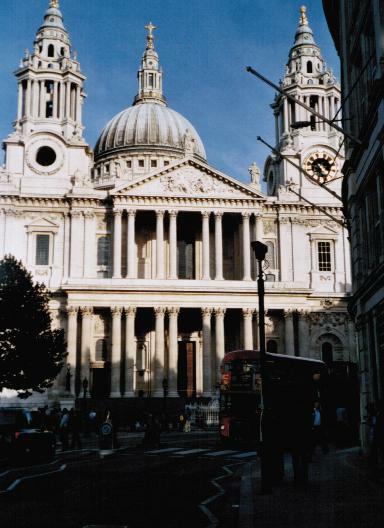 King Charles II declared 10 Oct. 1666 an official day of fasting to commemorate the Great Fire of London, and thereafter (until 1859) annual services were held at St. Paul’s every 2 September asking God to deliver Londoners from another such fire. A Royal Display in the Crypt of St. Paul’s Cathedral, 10 October 2008, included this picture of the Great Fire of London burning down the old St. Paul’s Cathedral. In the prophetic maxims of Mark 13:8, such “troubles” in this world, “are the beginnings of sorrows” which are a general warning that types the future trouble men will face on the Day of Final Judgment if they do not accept “the gospel” (Mark 13:10,32-37). St. Paul’s Cathedral, London, England, UK, 10 October, 2008. Pictured in front of this Anglican Cathedral is a red double-decker bus coming around the corner, (lower right), a common scene on the streets of London. 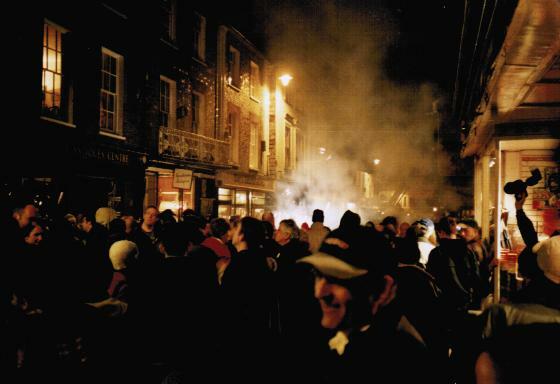 BONFIRE NIGHT IN LEWES, 5 NOV. 2008. 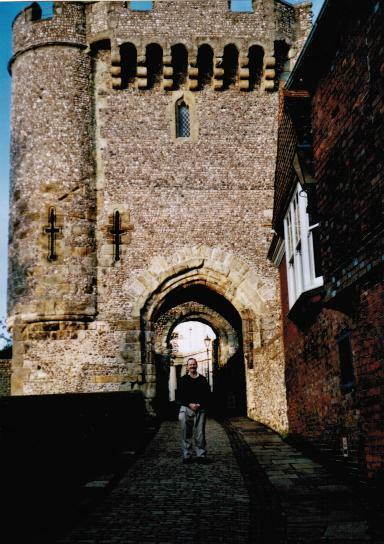 Lewes in England was formerly a major city; evident in Lewes Castle, built by William de Warenne, later the Earl of Surrey, a General of William the Conqueror who came in 1066. Nov. 2008. Gavin at Lewes Castle, England, UK, Nov. 2008. King Henry III [Regnal Years:1216-1272] fought Simon de Montfort at Lewes Battlefield in 1264. After this battle, Henry III accepted a council of Lords, Churchmen, and merchants to advise him; and this council of “parlement (speaking place),” became over time, the Westminster “parliament” form of government. 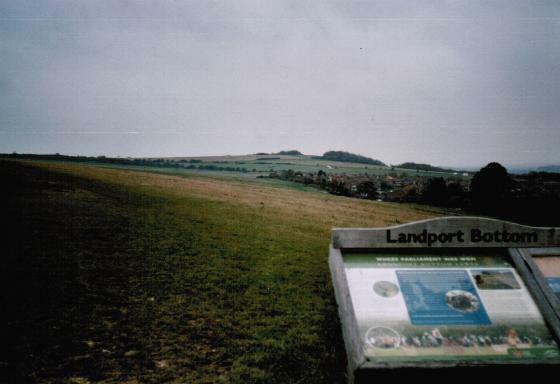 Looking over the battlefield that gave rise to a parliament. Lewes, England, UK, Nov. 2008. 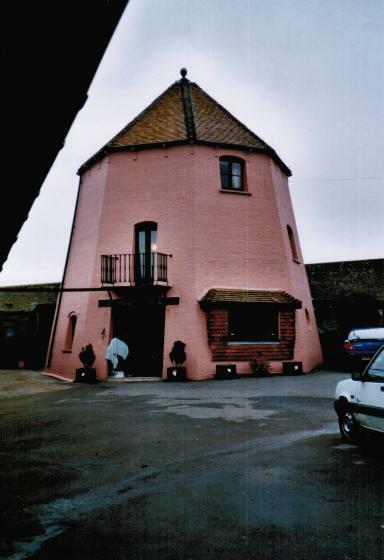 During the 1264 battle, when Simon de Montfort thought he was going to lose, he hid in this windmill, now a private residence near the battlefield, with the windmill removed from it. Lewes, England, UK, Nov. 2008. 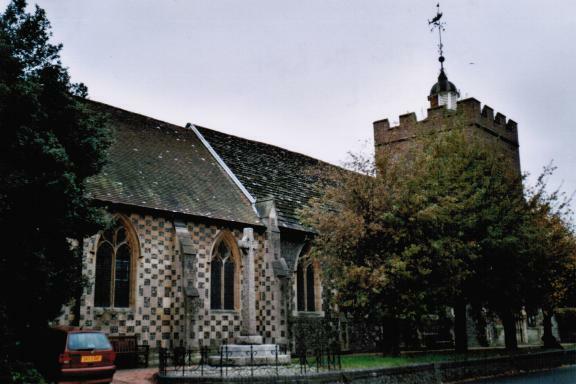 St. John the Baptist Church of England, Lewes. 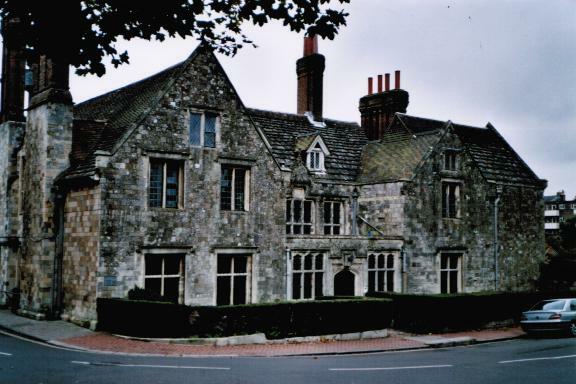 An Evangelical Anglican Church, by tradition the Bishop of Chichester always appoints an Evangelical Bishop of Lewes, Nov. 2008. 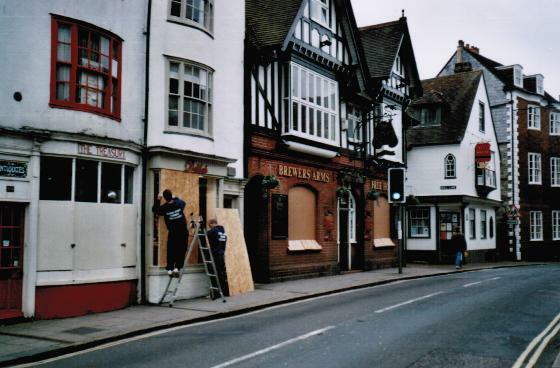 A historically important city, Lewes was a front-line battlefield for Protestantism in the time of the Romish queen, Bloody Mary (Regnal Years: 1553-1558). 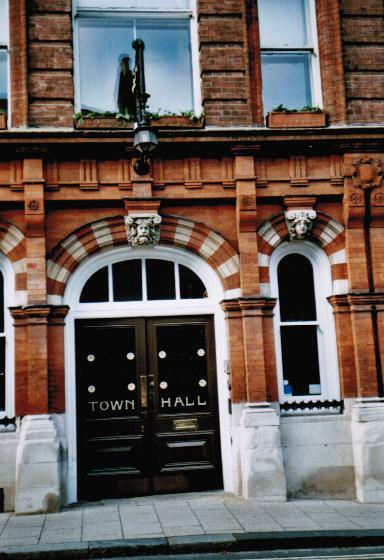 Lewes Town Hall, England, UK, Nov. 2008. 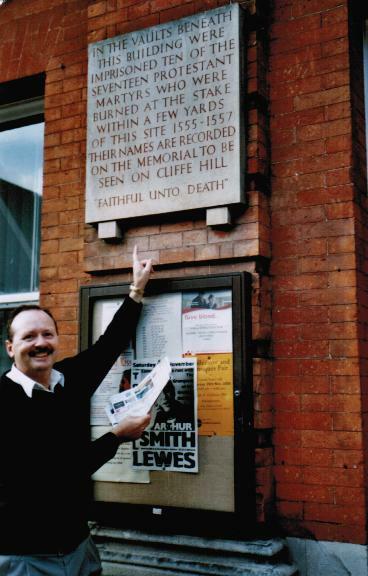 Gavin pointing to a sign at Lewes Town Hall referring to where “Protestant Martyrs” were “imprisoned” below, and 17 “burned at the stake” nearby in “1555-1557” as “recorded” on the “Cliffe Hill” “Memorial;” being “ ‘faithful unto death’” (Rev. 2:10, AV). 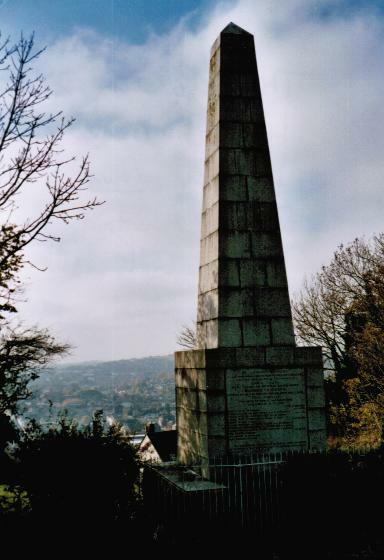 Lewes Marian Martyrs Memorial, overlooking Lewes. Nov. 2008. 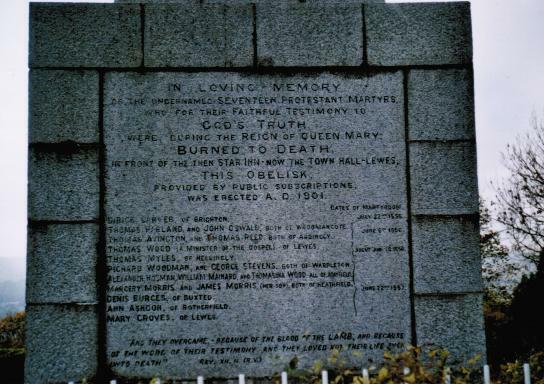 Names of Protestants on Lewes Martyrs Memorial, England, UK, Nov. 2008. 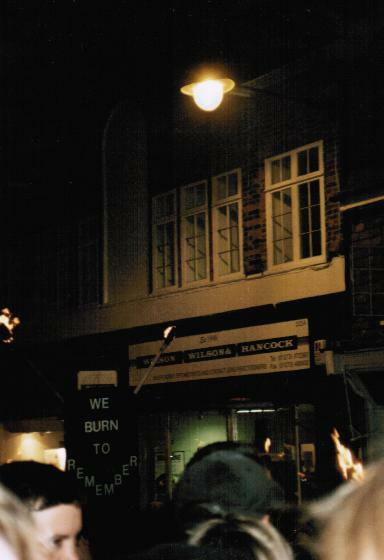 Eve of Gunpowder Treason Day, Cliffe High Street, 4 Nov. 2008. 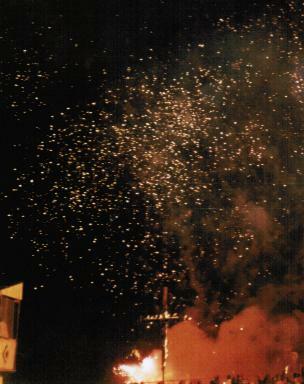 A fanfare of fireworks. 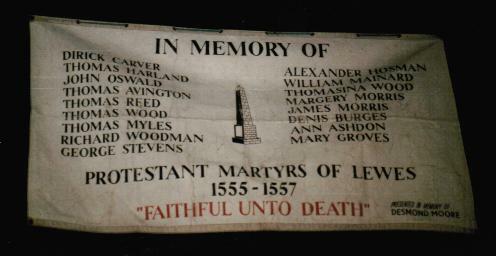 A banner is hung to remember the Protestant Martyrs of Lewes killed under Bloody Mary. 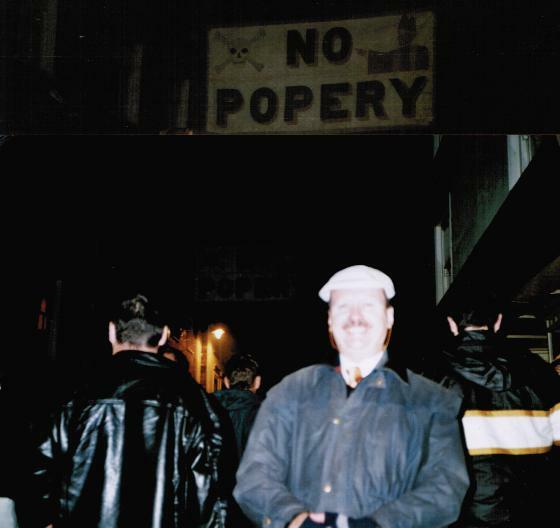 The “No Popery” banner is hung. 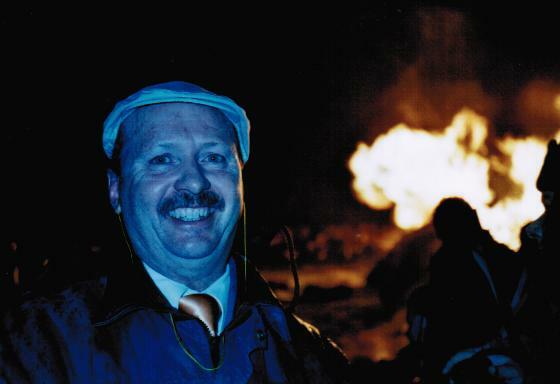 Gavin with an orange tie for William of Orange has earplugs in (connected with golden string) for ear protection from fireworks in the narrow street, 4 Nov. 2008. A fanfare of fireworks along the road is lit. 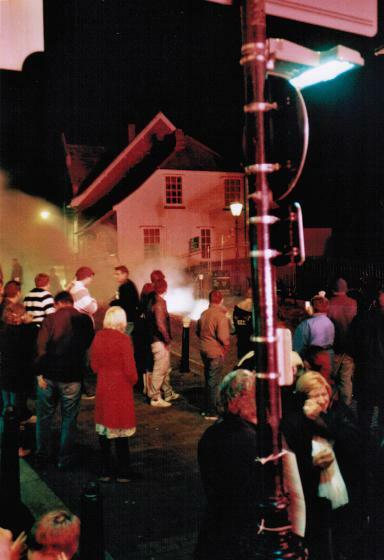 Eve of Gunpowder Treason Day, Cliffe High Street, Lewes, England, UK, 4 Nov. 2008. 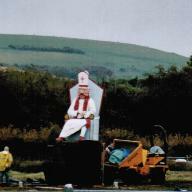 Papists Conspiracy Day preparations for Bonfire Night. 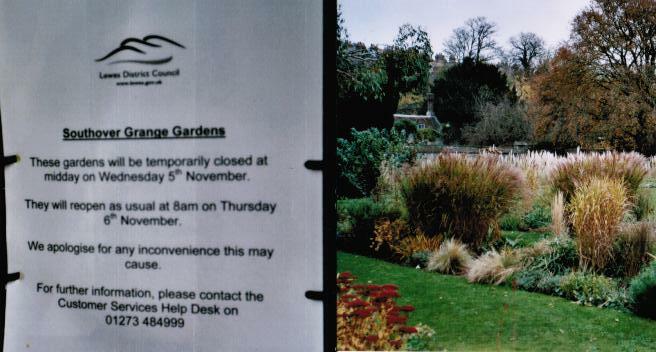 The Lewes Shutdown & Turn-Around for Bonfire Night: The Gardens close. 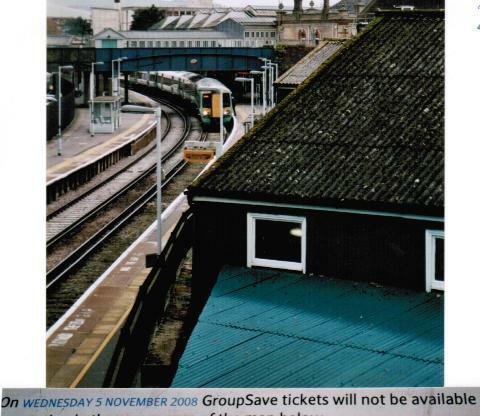 The Lewes Shutdown & Turn-Around for Bonfire Night: The trains stop. 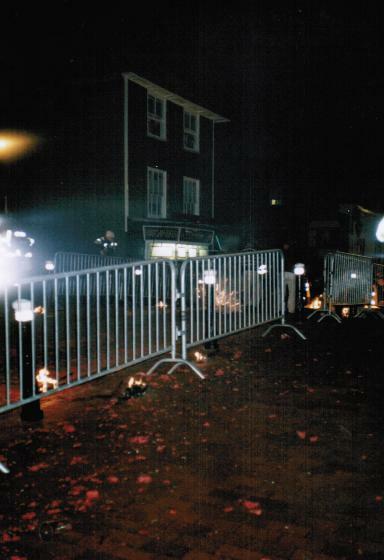 The Lewes Shutdown & Turn-Around for Bonfire Night: Buildings are barricaded. 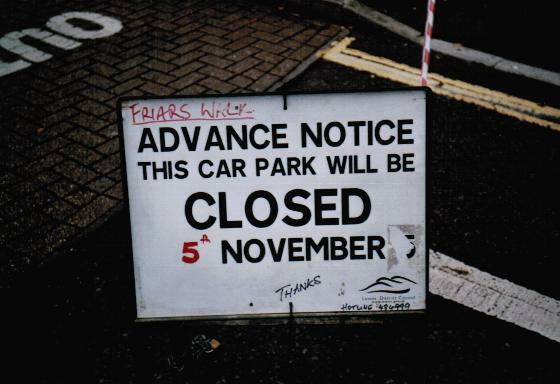 The Lewes Shutdown & Turn-Around for Bonfire Night: The Car Park is closed. 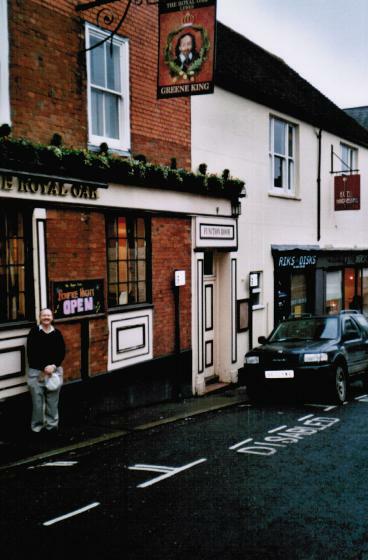 Gavin at The Royal Oak next to a sign reading, “The Royal Oak, BONFIRE NIGHT we are OPEN … .” Nov. 2008. 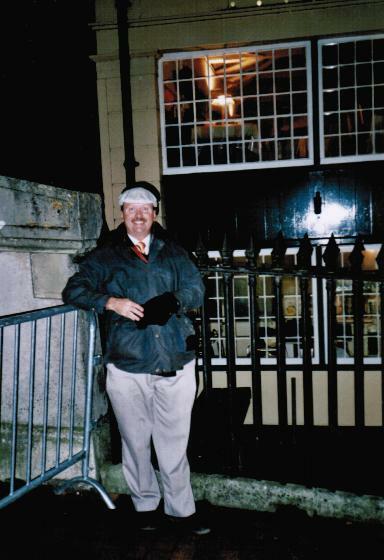 Gavin with an orange tie for the Protestant King William of Orange whose coming on 5 Nov. 1688 is also remembered Papists’ Conspiracy Day, in his bird’s-eye at the front barricade of the Ouse River Bridge, Cliffe High Street, Lewes, 5 Nov. 2008. 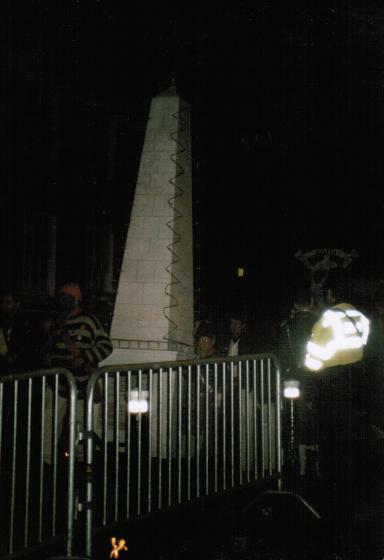 A parade replica form of the Lewes Martyrs Memorial to the 17 Protestant Marian martyrs of Lewes killed under the Romanist Bloody Mary between 1555 and 1557 is carried in the Bonfire Night procession. 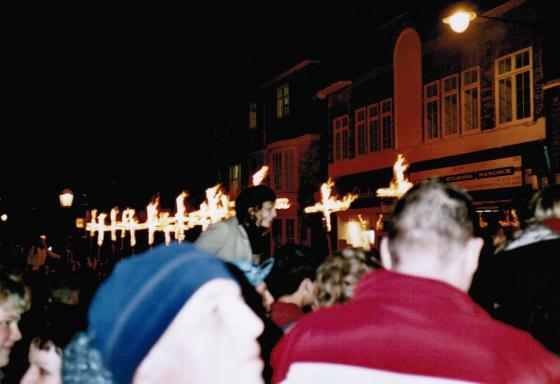 17 blazing crosses, one for each of the 17 Protestant Marian martyrs of Lewes killed by the Papists under Bloody Mary between 1555-1557, are carried in the Bonfire Night procession, Wednesday 5 Nov. 2008. One by one, the 17 crosses representing the 17 Marian martyrs of Lewes are each individually cast into the River Ouse from the Ouse River Bridge at Lewes. 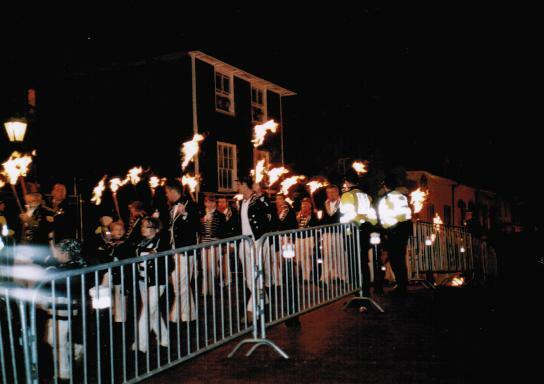 Torches burn bright in the Bonfire Night procession of Lewes, 5 Nov. 2008. 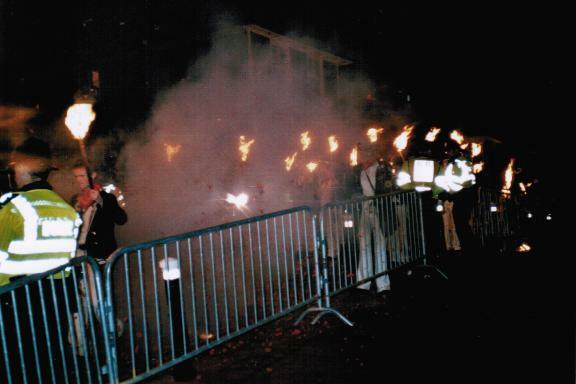 Fireworks are placed along parts of the Ouse River Bridge and then exploded, so that marchers temporarily disappear in a cloud of smoke. Wednesday 5 November 2008. An effigy of an organizer of the Papists’ Conspiracy, the Romanist Guy Fawkes, known as “The Guy,” with a noose around his neck, for he was: hung, drawn, and quartered; is carted in procession, later to be burnt in a bonfire. 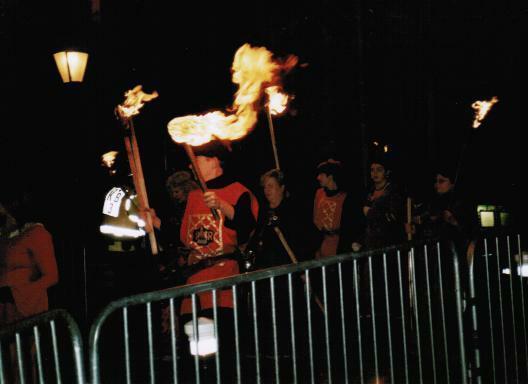 A marcher with torch has the embroidery “IR” (Latin, meaning “James King”) in memory of the foiled Papist conspiracy to blow up the Protestant King James I of the King James Bible and Members of Parliament on 5 Nov. 1605. Here comes the tub of tar! 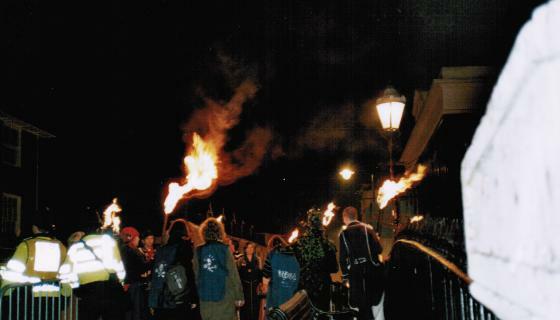 By tradition, a barrel or tub of blazing tar is thrown over the Ouse River Bridge at Lewes, England, UK. 5 Nov. 2008. 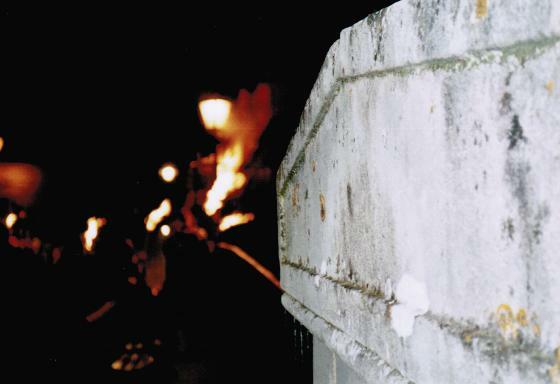 The Bonfire Night procession ends, and fireworks laid all over the Ouse Bridge are exploded. 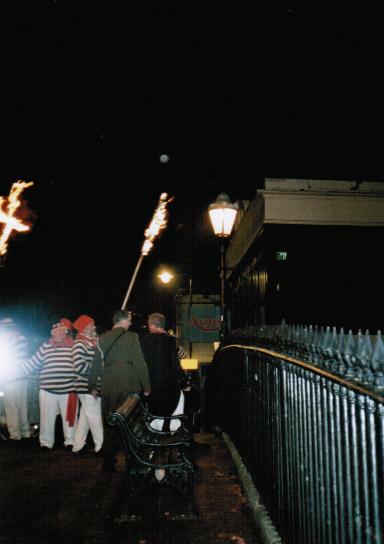 People now disperse to one of the seven bonfire sights of the seven Lewes Bonfire Societies, of which Gavin considers Cliffe Bonfire Society is the best. Gavin goes to the Cliffe Bonfire Society sight which has three bonfires, and which he considers is generally the best Lewes Bonfire Society. 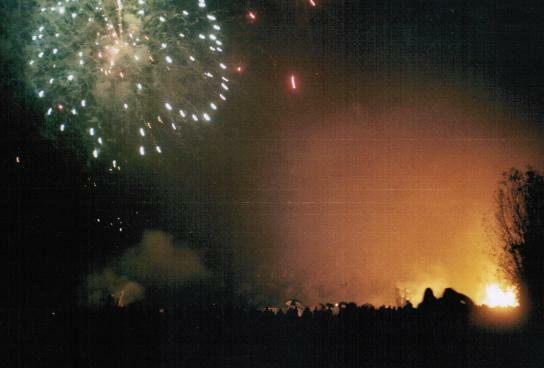 Bonfire Night, 5 Nov. 2008. 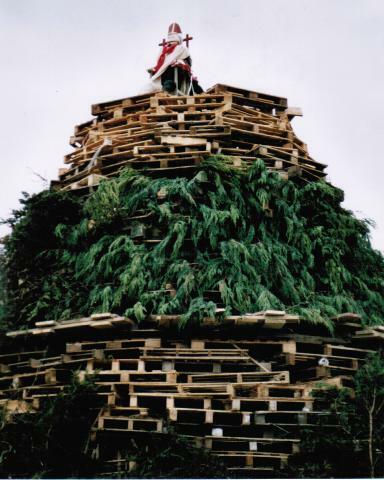 Bonfire 1, with an effigy of the Pope and Guy Fawkes on top, is ignited. 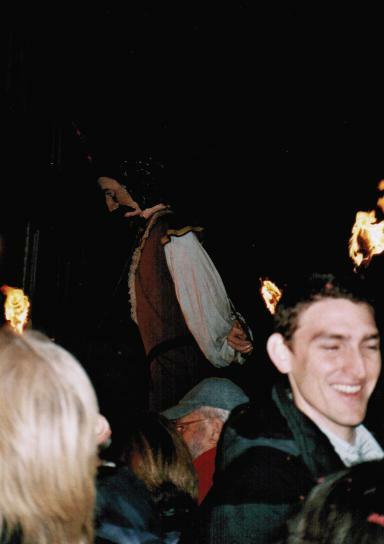 The Protestant, Gavin, at the Cliffe Bonfire with an orange tie for the Protestant Christian King, William III of Orange who came on 5 Nov. 1688, with the effigies of the Pope and Guy Fawkes now consumed in the fire to his left shoulder, in Bonfire 1. Wed. 5 Nov. 2008. 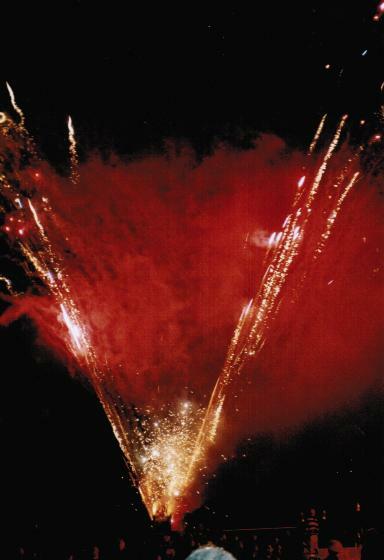 Bonfire 3 with a wooden effigy of Pope Paul the Fifth (Pope from May 1605 to 1621), is exploded, and once again, sky rockets shoot out into the air around the Pope in a V shape for Protestant “Victory” over Popery. 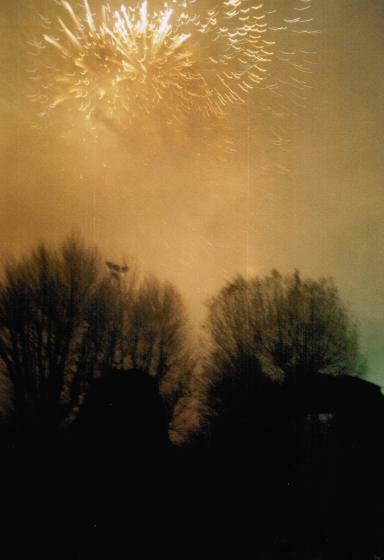 Fireworks are exploded & light up the night-sky, Bonfire Night, Lewes, Wed. 5 Nov. 2008. 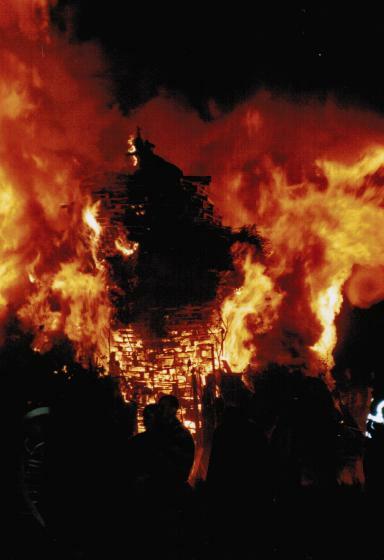 Bonfire Night fireworks, Lewes, England, Papists’ Conspiracy Day, 5 Nov. 2008.